Okay, this is in the “Well… I told you so” category. Recently, I have (briefly, at least) debated the meaning of “natural born citizen” with New Jersey birther attorney Mario Apuzzo. Mr. Apuzzo is one of the “leading lights” of the birther movement, on the side that claims that birth on US soil plus two citizen parents is required in order to make a natural born citizen. This novel claim goes directly against the understanding of… well, pretty much everybody… that if you’re born a citizen, then you’re a natural born citizen. Mr. Apuzzo claims that the Supreme Court, in the case of Minor v. Happersett (1875), established a “binding precedent” and a “definition” that a natural born citizen means what he says it means, and not what the rest of us have always understood. Okay… Except that’s not at all what these cases say. Minor v. Happersett clearly did not establish any such “binding precedent” or “definition” of “natural born citizen.” It is a very bad example of lawyerly word-twisting to claim that it did. Now if the Court had given such a “definition,” it still would’ve merely been non-binding dicta, or side commentary — as any such determination was clearly non-essential to the matter they were deciding. Such reasoning might have been convincing to a later Court — or it might not have been. But the fact is, they simply didn’t create any such “definition” of “natural born citizen” — in spite of Apuzzo’s (and Leo Donofrio’s) elaborate twisting of their words to try and make it sound as if they did. If he was “natural born,” and he was “a citizen,” then it is inescapable that the Court found young Mr. Wong to be a natural born citizen. The 6 Justices who agreed on the majority opinion (against only 2 dissenters) also discussed the implications of such status for Presidential eligibility. So they in fact found that Wong Kim Ark would be legally eligible to run for President upon meeting the other qualifications — reaching the age of 35, and 14 years’ residence. 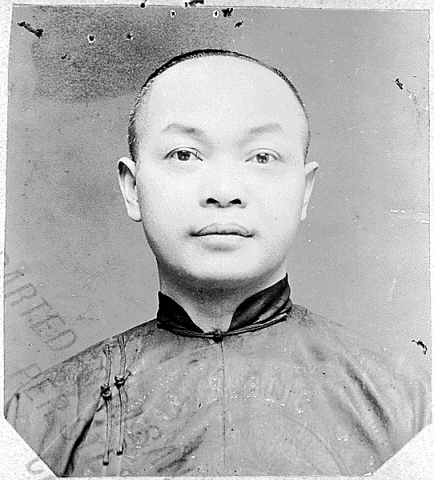 Mr. Wong, who lived most of his life as a simple Chinese cook in Chinatown, never ran for President, of course. And in the highly racial America of his day Wong almost certainly could not have been elected if he had tried. But according to the United States Supreme Court, legally speaking, Mr. Wong DID HAVE the legal qualification to eventually run for, and serve as, President of the United States — if the People should have decided that he was the right person for the job. There’s much deeper we could go into the issue, of course. I haven’t found the time to refute Mr. Apuzzo’s bogus “two citizen parents” claims in the full, absolute detail that I would like to. There is an awful lot of refutation here, here, and here, though. It would be nice to put ALL of the pieces together in one place. However, for those who don’t mind a bit of digging, the references given above are a good start. But never mind — a court in the State of Arizona the day before yesterday quite clearly and authoritatively refuted Mr. Apuzzo for me. The court smacked down Apuzzo’s and Donofrio’s claims in no uncertain terms. This entry was posted in I Told You So, Natural Born Citizen. Bookmark the permalink. Mario says that the ruling doesn’t count because it is too short and is not an “in depth analysis”. He also makes some convoluted argument that WKA came over 100 years after the Constitution was written so it doesn’t count either. The school where Mario got his law degree must be trying to see if they can seal the records. I tend to think that 5 minutes after Judge Gordon read the quoted paragraph in Minor he was already writing his order. What’s the required page length for a court ruling to be valid? This would seem akin to the birther argument that since almost nobody believes the birthers or will publish their garbage, there’s a vast conspiracy to silence them. A lack of coverage = vast conspiracy of silence. And oh, if Apuzzo is really claiming that we can throw out all Supreme Court rulings since 1887, then we might as well just fire the Supreme Court, purge the law books, and return to the days of Judge Roy Bean. I’m sorry Reality Check, but you do not win here either. 1. In-depth analysis is not required in this decision, as a clear and binding US Supreme Court precedent based on such in-depth analysis applies. All the court needed to do was cite that case. 2. It is completely irrelevant that the ruling in Wong Kim Ark was handed down in 1898 and not 1810. The Court also found Wong Kim Ark to be “NATURAL BORN,” as well as finding him to be “a citizen.” A citizen who is natural born is a natural born citizen. 3. I’ve uncovered no evidence to dispute the fact stated by the Wong Court that the Founding Fathers used the rule above. On the contrary, James Madison, Father of the Constitution, said that there are two criteria used to establish the allegiance that makes for citizenship. The more important of those, and the one that applied in the United States, was birth in the country. And Thomas Jefferson wrote a citizenship law for the State of Virginia which provided that ALL white children — with no reference to the citizenship of their parents — born within the territory of the Commonwealth of Virginia, were citizens. There’s lots more than can be and has been cited. 4. The bogus claim in Minor v. Happersett has been dealt with almost ad nauseum. I don’t know that I would use the word “defined,” because it seems to imply an equality. An equality reads the same in both directions. If A=B, then B=A. That’s math. What we have is not an equality. It’s an if… then. Or, one thing => (implies) another. This does NOT necessarily mean that A alone, or B alone, don’t imply C. That’s a logical fallacy. that A does not => C.
Those doubts were resolved in US v Wong Kim Ark. And pretty much everybody except for a few birther lawyers and their followers acknowledges this. As for using the term “definition”, I’m pretty careful when I talk about math (and formal logic), and I think the term applies here. A statement is either justified because it follows logically from previous statements or it is justified “by definition” (i.e. it is taken as an axiom). There is no logical implication that this sort of definition is exclusive. Consider trying to define the word “green” to someone–you might give examples which defined particular things as green such as: “Broccoli is green”, but it is clear that the definition is not saying that “Broccoli” and “green” are equivalent. Other than that, I agree with you and find it annoying that birthers can’t even manage to avoid the simplest of logical fallacies. I think in many cases, it’s not due to lack of actual logic. My personal opinion is that in many cases, it’s due to deliberate twisting. The case may have been dismissed with prejudice, but that doesn’t mean we’ve seen the last of it. Here in Arizona, what we call the “Superior Court” is actually the trial-level court of general jurisdiction. I assume Mr. Allen will appeal to the intermediate level court, or skip that and try to go straight to the Arizona Supreme Court. Oh, I’ve no doubt it will likely be appealed. Most of them are. The problem is this: THE CASE HAS NO MERIT. Mario Apuzzo’s claims have NO MERIT. AT ALL. I’ve done enough research not to have the slightest doubt of this. There is no substantial evidence that the Founding Fathers ever intended “natural born citizen” to mean “born on US soil of two citizen parents.” There just isn’t. If they had meant that by the term, then they would’ve told us. They wouldn’t have made statements that birth in the country is what applies in the United States (James Madison). They wouldn’t have written laws that provided that every white person born on the soil was equally a citizen (Thomas Jefferson), with no mention whatsoever of parents. It’s true that David Ramsay, one of the major historians of the American Revolution, wrote an essay in which he gave a similar definition. But first of all, Ramsay’s entire CONTEXT had to do with NATIVE colonial parents who did not take part in the Revolution. It had to do with SEPARATING THE BRITISH LOYALISTS FROM THE AMERICAN REVOLUTIONARIES. Ramsay had nothing at ALL to say about the citizenship of the children of immigrants born AFTER the founding of the new nation. NOTHING! And beside that, in the only known matter where Ramsay’s views on citizenship were put to the test, Ramsay was OUTVOTED — THIRTY-SIX TO ONE! And the Founding Fathers CERTAINLY would not have used a term — “natural born subject/ citizen” — that had always included the children born on the soil even of alien parents, if that wasn’t what they meant. Even John Jay’s letter to Washington didn’t underline the word “natural” — although if it had, it would’ve been referring to the English idea of natural law, and not the Swiss one. Vattel is claimed as providing the definition for “natural born citizen.” But it’s clear that English common law was a vastly more significant influence than Vattel; and the passage quoted was never translated “natural born citizens” until 10 years AFTER the Constitution was written. Apuzzo gave as “evidence” of the influence on the Founding Fathers a quote that one Peter Van Schaack read Vattel one winter. But not only was Peter Van Schaack not a Founding Father — he was an adamant British loyalist who actively opposed the Revolution and who moved to England for 7 years after American Independence. The birther claims regarding the Founding Fathers are all blatantly, even brazenly, false. I’ve been through much of Mario Apuzzo’s 199-page “brief” on the subject. In case after case, the very historical and legal authorities that Apuzzo cites as being on his side refute him. Secondly, as this court stated, Minor v. Happersett simply doesn’t say what Apuzzo and Donofrio claim it says. Even if it did it would be dicta, and even if it weren’t dicta, any statement in Minor would’ve been superseded by US v Wong Kim Ark. Thirdly, Wong Kim Ark was clearly found by the Supreme Court to be a NATURAL BORN CITIZEN. So the entire birther argument is nonsense. The birther movement is not a movement of truth. It’s a movement of unfounded assertions, delusion, word twisting, legal and historical misinterpretation, propaganda, censorship, ugly personal attacks on those who state facts and evidence, and — in some cases — outright lies. The thing about Dr. Ramsay’s dissertation is that it was written specificaly as part of his campaign to undo the election of 1788. An election in which he came in third. And to add insult to injury, he wrote a leter to James Madison asking Madison to support him in his petition to Congress. Presuming on our ancient acquaintance I take the liberty of soliciting your attention to an affair of mine that is now before your Honorable House. One of the elected federal representatives of this State is, in my opinion, ineligible. This case is in short thus: this gentleman alluded to left Carolina in the year 1770 his parents died about the same time and he was absent from America during the whole of the war and till November, 1783. As in the time of his absence the Revolution took place I contend that in order to his becoming a Citizen of the United States something must have been done previously on his part to show his acquiescence in the new government established without his consent. The lowest test of acquiescence is in my opinion residence in the country. Till he resided under the government of the United States I cannot therefore see how he acquired citizenship. We were all born subjects but you and I were cleared from our allegiance by the restraining act of Parliament passed in December 1775. You and I became citizens by being parties to the Declaration of Independence. By that act a new compact for a new government was form between the then residing and consenting inhabitants of the States. But an absent native neither lost his allegiance by the one nor acquired citizenship by the other. Such continued, subjects while in Europe and under British protection and could become Citizens on their returning and by residence by an oath or by some other move manifesting their acquiescence in the revolution. It is impossible to do justice to the argument in a ____ nor is it necessary to one of your enlightenment and understanding. But as the subject is new I beg your attention to it and if your opinions ____ with mine I shall thank you for supporting my Petition on the subject when the merits of it are discussed before your Honorable House. I am Sir with great respect and esteem your most obedient and Humble Servant. Madison obviously didn’t agree with him. Very interesting. No, Madison didn’t agree with him. The fact is, almost NOBODY agreed with Ramsay’s rules for citizenship. THIRTY-SIX TO ONE the guy was voted down. And his essay had NOTHING to do with children born of resident aliens after Independence. And yet, here’s one of the main guys Apuzzo quotes as supposed evidence the Founding Fathers were in favor of his position. It’s just all lies. The entire birther movement is built upon nothing but lies. A visitor here, “DyingTruth,” attempts to repost, without comment, an entire blog post from last December by now retired birther lawyer Leo Donofrio. I consider that outside of the bounds of legitimate commentary. However, I will post a link to that particular post at Donofrio’s blog, and I will even concede that Donofrio seems to have a point here. Even a blind pig finds an occasional turnip. The blog post in question is this one. I’m not going to look at this in great detail right now because frankly, given the abundant clarity with which the Supreme Court informed us in US v Wong Kim Ark that the child born on US soil of alien parents is in fact a natural born citizen (see for example the reference near the bottom of this comment) it’s just not that important. I did look at it earlier, probably back in December when Donofrio came out with it, and he seemed to me to have a legitimate point in this particular instance. Donofrio’s point is that Jack Maskell’s 50-page (!) report for our members of Congress, entitled Qualifications for President and the “Natural Born” Citizenship Requirement, dated November 14, 2011, contains an error. Again, I haven’t researched it recently but from past memory, I believe Donofrio was correct on this one point. In fairness, I’ll say that Donofrio appears to have followed through on his pledge to deliver further criticisms of Maskell’s report. I frankly haven’t bothered to read Donofrio’s criticisms of Maskell over the past 2 or 3 months. I may get around to it, or I may not. I have read enough of Maskell’s report to know that it is accurate in the main, and I’ve read enough complete and utter claptrap from Donofrio to know that he’s not the place I’m going to go for any kind of accurate analysis. Anyone who wants justification for that past statement can do some digging into the various comments I’ve made in the past on Donofrio’s claims. And don’t attempt to give me a hard time without actually reading all the stuff I’ve written about Donofrio in the past. I had a fleeting moment of self-doubt. Could I have missed this case? Did the Supreme Court really state that the son of two aliens was a natural-born citizen? The Twilight Zone theme suddenly chimed in. I then clicked over to the actual case, and of course, the Supreme Court said no such thing. But the Supreme Court actually did say such a thing. Not in this particular case, perhaps, but in United States v Wong Kim Ark. For more information on what the Court said in that case, I refer readers to my commentary here. You may also wish to pay attention to some of the other writing there, including related comments by ehancock. Finally, if you want to see what rubbish Mario Apuzzo’s stuff is, the conversation on that page is likely to be informative.